The economy—B. When Obama took office, the US economy was careening over a cliff. He reached out a trekking pole and stopped the slide. "Am I better off now than I was when I was sliding toward the abyss? Duh!" Kristof writes. But "the administration blew it with overoptimistic comments that shredded its credibility," it was deaf to crony capitalism complaints, and it did unconscionably little to help struggling homeowners. Education—A-. At long last, Obama got Democrats to make school reform a major priority, and he wasn't afraid to borrow GOP ideas or offend teachers' unions to do it. Other domestic issues—B+. He ended "don't ask, don't tell," took a step towards immigration reform, and, oh yeah, passed health care reform, something Democrats have wanted for decades. Foreign policy—B+. Obama got us out of Iraq and handled Libya beautifully, but the Afghan surge "has accomplished little except a huge increase in blood and treasure spilled," and his Middle East peace effort collapsed thanks in part to "administration infighting and ineptitude." Communication—F. Policy isn't everything; a president's main job is to be a "national team captain. There Obama failed us." Yes, you're supposed to campaign in poetry and govern in prose, "but the prose doesn't have to be chilly Latin!" being president really has aged Obama,it just is not good for him,he cannot take it well,it seems to be making him sick,and his wife too.they just need to leave and go back to Hawaii and have a lual by the beach.Leave the job of President of the United States to someone who can do the job right.In Fact Obama should gladly go,because he knows how much he has failed and messed up as president.And those of you who want to pat Obama on the head and say oh!! you can do better in 4 more years,need your head checked! because this is about a whole entire country,not who you like better,it is about who can do the job!! The Democrats just need a puppet to do what they say,Most of them know Obama has not been good for this country,honestly! you would have to be from another planet not to know how bad Obama has been for America! that is a fact! it is time to get this country on the right path,and it is not the path Obama wants. Thank God when he is out! with a few others in the White House. 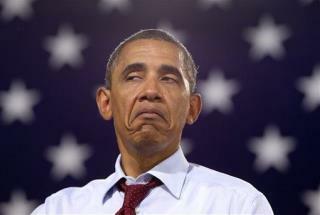 Get used to the photo used; that's gonna be his permanent look after we rid the White House of him.